There are many tools out there for data scientists to perform big data analyses, but at the end of the day, don't you still have to justify those results to management? Lots of numbers on paper or in a database is hardly presentable to key stakeholders. This intermediate Google Apps Script codelab leverages a pair of Google's developer platforms, G Suite and Google Cloud Platform (GCP), to help you complete that final mile. Google Cloud's developer tools let you perform the deep data analysis then take those results, put them into a spreadsheet, and generate a slide presentation with that data, providing a more suitable stage for the results to be delivered to management. This codelab covers the GCP's BigQuery API (as an Apps Script advanced service) and the built-in Apps Script services for Google Sheets and Google Slides. For this codelab, we wanted to bring as much of the technologies together into a single app while showcasing features and APIs from across Google Cloud in a way that also more closely resembles a real-life use case. The goal is to inspire you to use your imagination and consider problems that allow you to leverage both GCP and G Suite to solve challenging problems for your organization or your customers. How would rate your experience with Apps Script specifically? How would rate your experience with GCP developer tools & APIs? Now that you know what this codelab is about, what are you going to do exactly? Let's get started with some background information on Apps Script, BigQuery, Sheets, and Slides. NOTE: It is, for the most part, outside of the scope of this codelab to teach you Apps Script. There are plenty of online resources to help you with this. The official documentation features an overview with quickstarts, tutorials, and videos as well. And finally, don't forget about the Apps Script introductory codelab, which should be completed before starting this one. A built-in service provides high-level methods that you can use to access to G Suite or Google product data, or other useful utility methods. An advanced service is merely a thin wrapper around a G Suite or Google REST API. Advanced services provide full coverage of the REST API and can often do more than the built-in services, but require more code complexity (while still being easier to use than the REST API itself). Advanced services must also be enabled for a script project prior to using them. When possible, developers should prefer a built-in service because they're easier to use and do more heavy-lifting than advanced services do. However, some Google APIs don't have built-in services, so an advanced service may be the only option. Google BigQuery is one example of this... no built-in service is available, but a BigQuery advanced service does exist. (Better than no service, right?) If you're new to BigQuery, it's a GCP service that lets you perform simple (or complex) queries on very large data corpuses, say on the order of multiple terabytes, yet still can provide results in seconds. Unlike BigQuery, both Google Sheets and Slides have built-in services (as well as advanced services, which, you'd only use to access features found only in the API). See the docs for both the built-in Sheets and Slides services before jumping into the code. Of course there are also docs for the advanced services; here they are for Sheets and Slides, respectively. b) Otherwise you may see all your projects and a big +New button in the upper-left, so click it. c) If neither of the above, your screen may look like the below. If so, look for a hamburger menu icon in the upper-left corner and select +New script. d) For those of you who prefer the command-line. Your tool is clasp, specifically, you'll run the clasp create command. e) The final way to create a new script project is to simply go to the shortcut link: https://script.google.com/create. Click File > Save and give your project a name. Next you'll need to create a Google Cloud Console project in order to run BigQuery queries. Create a new project, give it a name, select a Billing Account is prompted, and click CREATE. When the project creation is complete a notification appears in the upper-right of the page. Click on the Create Project: <Project Name> entry to open the project. Click the three dots icon in the upper-right to expand the menu and select Project settings (direct link). Copy the value listed under Project number. Back in the App Script Editor, click Resources > Cloud Platform project. Enter the project number into the text box and click Set Project. When prompted, click Confirm. When complete, click the Close button to dismiss the dialog. 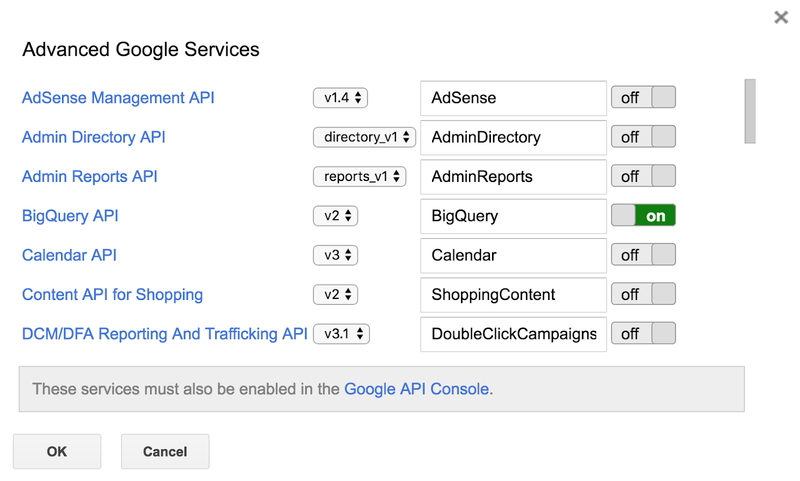 Now that you have a new project setup, you need to enable the BigQuery advanced service, so pull down Resources -> Advanced Google Services and flip on the bit for the BigQuery API. A note at the bottom states, "These services must also be enabled in the "Google Cloud Platform API Dashboard" (whatever it's called today), so click on that link which opens another browser tab to the developer console or "devconsole" for short. At the devconsole, click the +Enable APIs and Services button at the top, search for "bigquery", select the BigQuery API (not the BigQuery Data Transfer API), and click enable to turn it on. Leave this browser tab open. NOTE: after the API has been enabled, you may see a note on this page saying something like, "To use this API, you need to create credentials...," but don't worry about that for now—Apps Script will take care of this step for you. Back in your code editor browser tab, you're still on the Advanced Google Services menu, so click OK to close the dialog, leaving you in the code editor. Click the project name at the top, and name it whatever you like, "BigQuery demo" or similar—we named ours "final mile". Now you're ready to enter the application code, go through the authorization process, and get the first incarnation of this application working. * the BigQuery advanced service before you can run this code. // Replace sample with your own BigQuery query. // Wait for BQ job completion (with exponential backoff). // Get all results from BigQuery. // Return null if no data returned. // Create the new results spreadsheet. // Add headers to Sheet. This query looks through Shakespeare's works, part of BigQuery's public data set, and produces the top 10 most frequently-appearing words in all his works, sorted in descending order of popularity. Imagine how (not) fun it would be to do this by hand, and you should have an inkling of an idea of how useful BigQuery is. Up at the top to the left of your Google account avatar is the pulldown menu selector ( ). Click it and select Project settings. You'll see the project name, ID, and number. Copy the project ID and set the PROJECT_ID variable at the top of bq-sheets-slides.js to the value you got from the developer console. NOTE: If the menu selector gets sticky and inoperable, reload the page. NOTE: Once you authorize the app, once you don't need to repeat this process with each execution. It isn't until you get to Task 3 further on in this tutorial that you see this dialog screen again, asking for user permission to create and manage Google Slides presentations. Once you click Allow on the OAuth2 dialog window, the script starts running... you'll see a pastel yellow dialog at the top. It runs fairly quickly, so you may not notice that it's running or that execution has completed. Recognize what just happened... you ran some code that queried all of Shakespeare's works (not a HUGE amount of data, but certainly more text than you can easily scan on your own looking at every word in every play, managing a count of such words, then sorting them in descending order of appearances. Not only did you ask BigQuery to do this on your behalf, but you were able to use the built-in service in Apps Script for Google Sheets to put this data in there for easy consumption. The code for bq-sheets-slides.js (our chosen filename) you pasted in above (aside from PROJECT_ID which should have a real project ID) can also be found in the step1 folder in this codelab's GitHub repo at github.com/googlecodelabs/bigquery-sheets-slides. The code was inspired big the original example in the BigQuery advanced services page which ran a slightly different query... what are the most popular words used by Shakespeare with 10 or more characters. You can also see that sample in its GitHub repo. The purpose of runQuery() is to talk to BigQuery and send its results into a Sheet. Now we need to make a chart with the data. Let's make a new function called createColumnChart() that calls the Sheet's newChart() method to do this. Create chart. Add the body of createColumnChart() featured below to bq-sheets-slides.js right after runQuery(). It gets the sheet with data and requests a columnar chart with all the data. The data range starts at cell A2 because the first row contains the column headers, not data. * Uses spreadsheet data to create columnar chart. // Retrieve the populated (first and only) Sheet. // Place chart on Sheet starting on cell E5. // Create & place chart on the Sheet using above params. // NEW: Return the spreadsheet object for later use. * Runs a BigQuery query, adds data and a chart in a Sheet. // Return the spreadsheet object for later use. The final part of the codelab involves creating a new Google Slides presentation, filling the title and subtitle on the title slide, then adding 2 new slides, one for each of the data cells and another for the chart. Create slide deck. All of the work on the slide deck will take place in createSlidePresentation() which we're going to add to bq-sheets-slides.js right after createColumnChart(). Let's start with the creation of a new slide deck, then add a title and subtitle to the default title slide we get with all new presentations. // Create the new presentation. // Populate the title slide. // the dimensions of the data range; fails if Sheet empty. // Populate the table with spreadsheet data. // Add a chart slide and insert the chart on it. // Return the presentation object for later use. * and adds the data and chart to a new slide presentation. Save and run createBigQueryPresentation() again. Before it executes though, recognize your app now needs one more set of permissions from your user to view and manage your Google Slides presentations. Once you allow this permission, it'll run as before. Congratulations! You've now created an application that leverages the both sides of Google Cloud by performing a Google BigQuery request that queries one of its public data sets, creates a new Google Sheet to store the results, adds a chart based on that just-retrieved data, and finally creates a Google Slides presentation featuring the results as well as chart in the spreadsheet. That's what you did technically. Broadly speaking, you went from a big data analysis to something you can present to stakeholders, all in code, all automated. We hope this sample inspires you to take this and customize it for your own projects. At the conclusion of this codelab, we'll provide some suggestions as to how you can further enhance this sample app. * You may obtain a copy of the License at apache.org/licenses/LICENSE-2.0. // Return the chart object for later use. The manifest file is a system-level configuration file that Apps Script uses to know what execution environment to have available for your application. Covering the contents of a manifest file is outside the scope of this codelab, but you can get an idea of what it does. Below are additional resources to help you dig deeper into the material covered in this codelab as well as explore other ways of accessing Google developer tools programmatically. We aim to keep this codelab in-sync with the repo. Below are various "code challenges," different ways you can enhance or augment the sample we built in this codelab. This list certainly isn't exhaustive but should provide some inspirational ideas of where you can take the next step. BigQuery. Experiment with a different query for the Shakespeare dataset... perhaps find a query that interests you. Another sample query can be found in the original Apps Script BigQuery sample app. BigQuery. Experiment with some of BigQuery's other public data sets... perhaps find a data set that may be more meaningful for you. BigQuery. Earlier, we mentioned other queries you can try against Shakespeare's works or other public data tables, and wanted to reshare this web page as well as this one again. Sheets. Experiment with other Chart types. Sheets & BigQuery. Turn the tables around... perhaps you have a large data set in a spreadsheet somewhere. In 2016, the BigQuery team introduced the feature allowing developers to use a Sheet as the data source (see blog post one and two for more information). Slides. Add other slides to the generated presentation, such as images or other assets tied to your big data analysis. Here's a guide to the Slides built-in service to get you started. G Suite. Find use for other G Suite or Google built-in services from Apps Script, i.e., Gmail, Google Drive, Calendar, Docs, Maps, Analytics, YouTube, etc., as well as other advanced services. See the reference overview for both built-in and advanced services for more information.